Saint Sebastian has been called history’s first gay icon and the patron saint of homosexuals. His feast day is today (Jan. 20). Sebastian was an early Christian martyr killed in 288 on orders from the Roman emperor Diocletian. 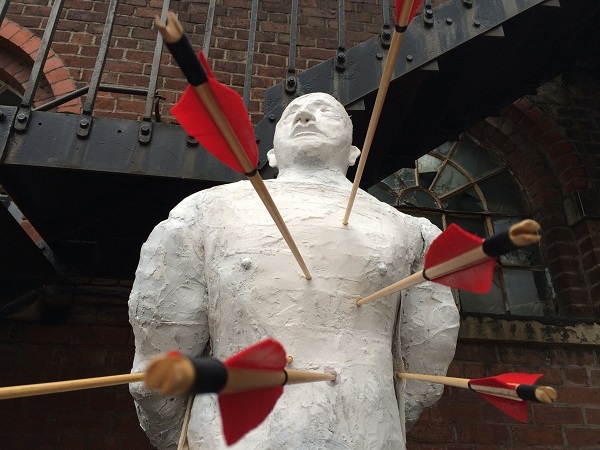 He is the subject of countless artworks that show him being shot with arrows. Little is known about his love life, so his long-standing popularity with gay men is mostly based on the way he looks. Saint Sebastian: History’s first gay icon? Starting in the Renaissance, Sebastian has been painted many times as a near-naked youth writing in a mixture of pleasure and pain. 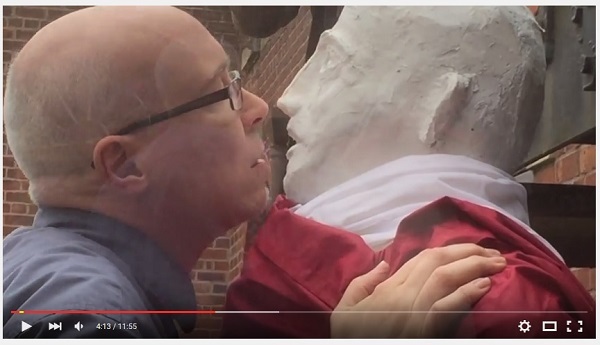 The homoeroticism is obvious. Two contemporary artists did new LGBT-affirming works based on Saint Sebastian in 2015. 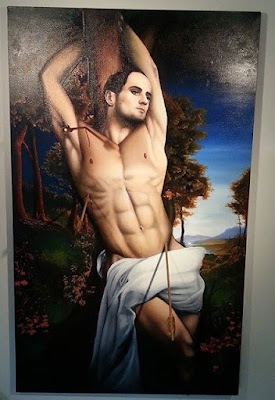 Gay New Zealand artist Christopher Olwage painted a self-portrait as Sebastian (at the top of this post) for his “Ecce Homo” exhibit inviting viewers to consider the possibility of a gay Jesus. 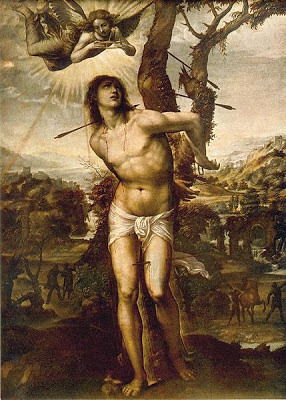 St Sebastian, loved and then abandoned by the Roman Emperor, Pray for us. For the whole litany and more info, see my previous post New art film highlights queer saints, Sebastian and homophobic violence for All Saints Day. The historical Sebastian actually survived the arrow attack and was nursed back to health by Saint Irene of Rome, only to be “martyred twice” when the emperor executed him later. In addition to his longstanding but unofficial status as patron saint of gay men, Sebastian is known as a protector against plague and a patron saint of soldiers, archers and athletes. Saint Sebastian is a favorite subject of contemporary gay artist Tony De Carlo (1956-2014), whose work is at the top of this post. He began his ongoing Sebastian series in the 1980s in response to the AIDS crisis. It has grown to more than 40 pictures. Sebastian is also referenced frequently in the gay literary world. For example playwright Tennessee Williams named his martyred gay character Sebastian in “Suddenly, Last Summer,” and Oscar Wilde used Sebastian as his own alias after his release from prison. An important film biography for many gay men today is “Sebastiane,” directed by British independent filmmaker Derek Jarman. The Latin-language 1976 film was controversial for its homoeroticism and is considered a landmark of LGBT cinema. A YouTube clip shows its beautiful style. The painting at the top of this post is by California gay artist Rick Herold. 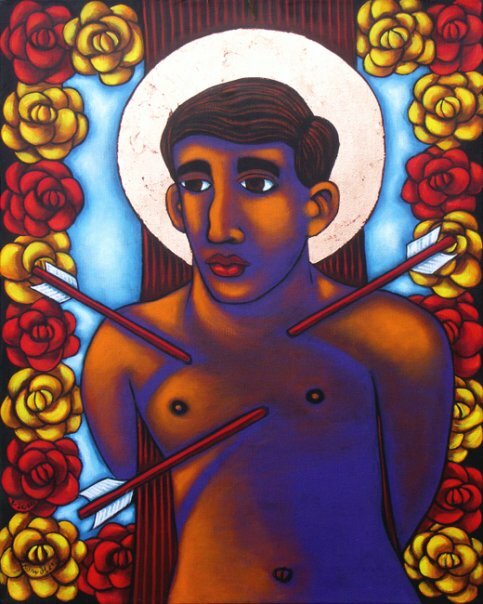 He places Saint Sebastian against a colorful, cartoon-like backdrop reminiscent of gay artist / activist Keith Haring. 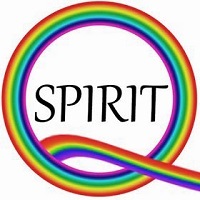 “I over the years as a painter have been interested in the idea of the spirit and the flesh as one -- began by Tantric art influences and then using my Catholic background,” he told the Jesus in Love Blog. He paints with enamel on the reverse side of clear plexiglas. Herold has a bachelor of arts degree in art and theology from the Benedictine Monastic University of St. John in Minnesota and a master of fine arts degree from Otis Institute of Art in Los Angeles. His religious artwork included a Stations of the Cross commissioned by Bob Hope for a church in Ohio before a conflict over modern art with the Los Angeles cardinal led to disillusionment with the church. Herold came out as gay and turned to painting male nudes and homoerotica. “Saint Sebastian and Matt Shepard Juxtaposed” by JR Leveroni compares Sebastian’s martyrdom with the killing of a contemporary gay martyr, Matthew Shepard (1976-1998). Shepard was a student at the University of Wyoming when he was brutally beaten and left to die by two men who later claimed that they were driven temporarily insane by “gay panic.” His murder led to broadening the US hate-crimes law to cover violence based on sexual orientation and gender identity. Leveroni is an emerging visual artist living in South Florida. 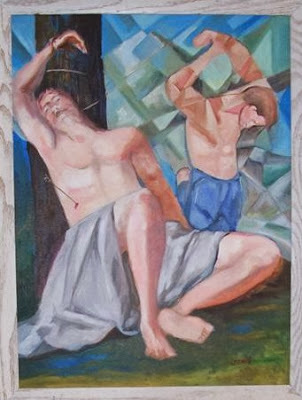 Painting in a Cubist style, he portrays the suffering gay martyrs in a subdued way with barely a trace of blood. A variety of male nudes and religious paintings can be seen on Leveroni’s website. Do you know the work of Michael Richards? He was a rising sculptor who'd won a residency in the World Trade Center, where he died on 9/11. His most famous and prophetic piece was a sculpture of himself as St. Sebastian dressed as a Tuskegee airmen being pierced by airplanes. (!!!) At first, many believed the piece was destroyed in the disaster, but he actually created two versions, one of which is still on exhibit. Much of his work contains airplanes and burning buildings. It's all very haunting and beautiful. He died at 38 and was on the cusp of a big breakthrough. I don't know if he was gay, but my friend Steve knew him...maybe he knew that info. Anyway, just had to share this extraordinary artist and this prescient work.